Tired of throwing out a flimsy shower curtain liner every few months, when it starts to tear or get mold spots? It's like throwing money down the drain. You won't have that problem with this long-lasting alternative. Damp, closed-up bathrooms are perfect breeding grounds for the organisms that can cause allergies, asthma attacks and other health problems. This liner is one less thing to worry about -- it is treated to keep mildew, molds and bacteria from growing on it. In fact, it's guaranteed to be mildew free for 15 months! 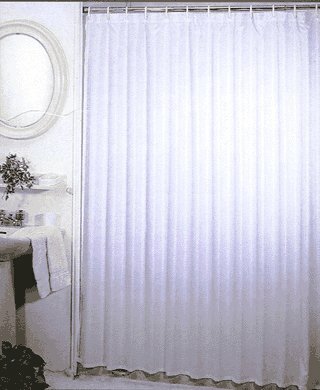 The liner is so substantial, it could actually stand on its own as a shower curtain. Plus, its weight keeps it from billowing while you shower, the way lightweight liners do. This material is exceptionally tear-resistant, and the header is reinforced with nylon mesh for even more durability. While plastic curtain ring holes tear almost as soon as you start pulling on the curtain, these metal grommets take whatever you dish out. They're coated to prevent rusting, too. Soap and oil residues are easily removed with a sponge and warm soapy mixture. To protect the anti-mildew finish, the liner should not be put in the dryer or ironed.